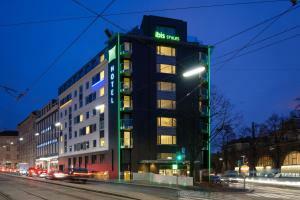 Ibis Styles Wien City is within a minute’s walk of different restaurants, and Vienna’s city centre, Saint Stephen’s Cathedral, the Hofburg Palace and Opera House can all be reached easily by different modes of public transport which are within 100 metres. Units at the Ibis Styles have free WiFi, a flat-screen TV with 96 channels, and a bathroom with a shower and toilet. The property has a lobby bar where snacks available, a drinks vending machine, and free tea, coffee and water are available until 22:00 in the lobby. Vienna Airport is 25 km away.